In a not-so distant future where all art forms have been banished, Hollywood is now just a deserted no-man's land. You and other has-been doppelgangers get together clandestinely inside a huge Hollywood movie studio, where you take part in crazy (we won't say wacky) races, racing through movie set after movie set, desperately looking for (not Susan, but) fame, props... and Effixium (but mostly Effixium). You've always dreamed of seeing your favorite heroes from the 80's race each other? 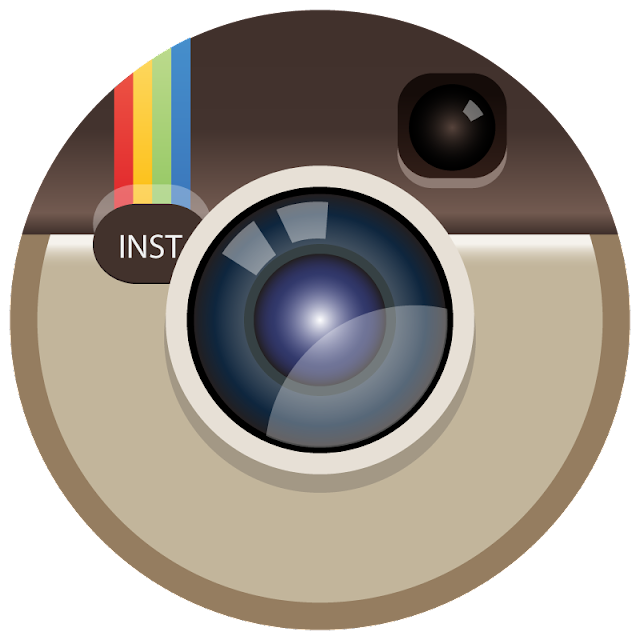 With Hollywood Death Race, you won't dream it anymore, you'll live it! Pick your pilot and your vehicle, and throw yourself in a race full of danger, traps and low blows. Don't trust anyone, stay alert, avoid your opponents special attacks and use yours to win the race! WARNING: This is a preview of Hollywood Death Race. All components and rules are prototype and subject to change. Hollywood Death Race arrived on Kickstarter on October 2, 2018. The theme of Hollywood Death Race will <BOOM!> <POW!> slap you in the face! You are taking on the roles of doppelgangers of well-known movie characters, meeting in the abandoned movie sets to race to the... well, death, or other nasty defeat. 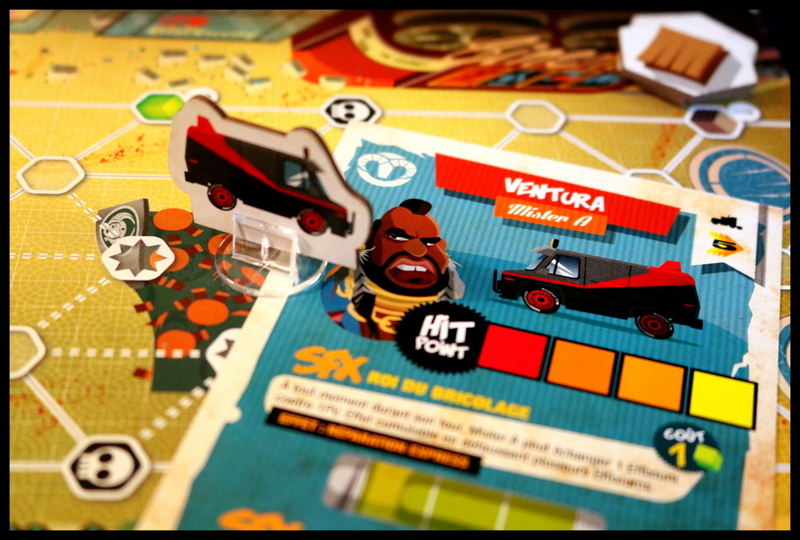 As soon as the box hit the table, my family and friends were laughing, tossing out movie quotes, and poring over the artwork to find familiar faces, from Hee-Tee & Peter on their BMX 1138 to Mister A in the Ventura van. Each section of the modular board contains plenty of Easter egg in-jokes, from the Props R Us and Radio Shacktivity at the Twin Pines Mall to the Cinema playing Dune, Tron, and The Goonies. Fans of 1980's pop culture are in for a treat! 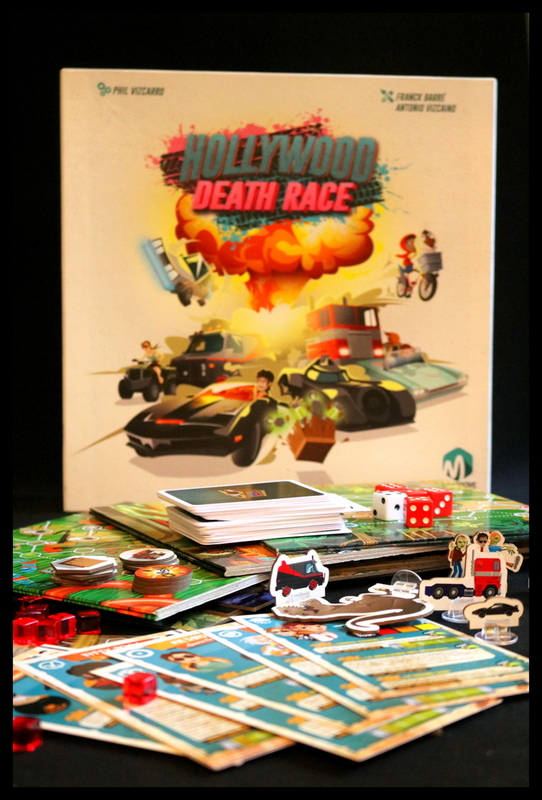 My copy of Hollywood Death Race is a prototype, but it is quite well put together, and I believe most of the engaging, bold art is in its final stages. Setup begins as you and your racing opponents choose sections from the modular board to create a racetrack. The board pieces include 3 small boards (one square about 8"), 3 big boards (two squares together), four L-turns, a start, and a finish. You can set the board up in any way that appeals to you and fits your space, which was handy when we were playing games on our long, skinny coffee table. I really appreciated that the rulebook includes a rough estimate for how long each board will take to complete, so you can choose fewer boards and turns for a faster game, or go wild and pile them all over your dining room table for an epic racing experience. If you're playing with 2-4 players, each player picks two vehicles - for more than 4 players, you set up three teams of two vehicles each. Your team can have a maximum of 5 class points (1 for light, 2 for medium, and 3 for heavy vehicles - so you can't take two heavies!). 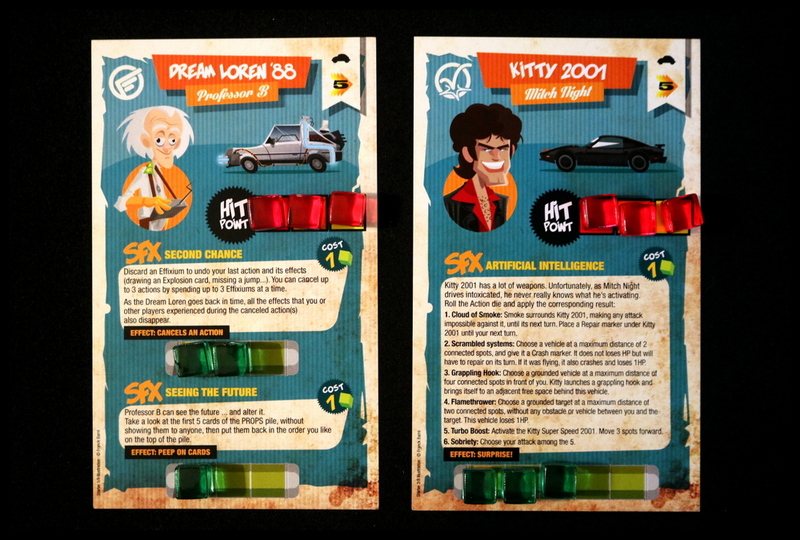 Will you choose Mitch Night driving the Kitty 2001, or Professor B in the Dream Loren '88? 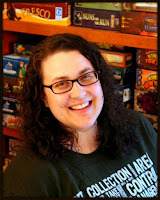 Find the vehicle minis (in my case, cardboard standees) to match, and make sure to take a flight marker if you take a vehicle with flight ability, like the Dream Loren! You'll set out some dice, cubes to represent HP and Effexium (the magical element you'll use to trigger your characters' special effects), shuffle the deck of Props cards, and you're ready to go. Setup is pretty quick and easy, something that my group always appreciates. The general mechanics and flow of Hollywood Death Race are easy to understand - this is a race! Get to the end first (with both your team's vehicles), and you win. 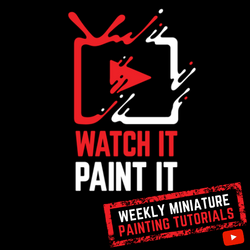 Each vehicle has some special effects they can use to get ahead or leave their opponents in the dust, and each board section has some special spaces and different actions, too. Most of our players were able to easily grasp the basics of the game and the information on their vehicle cards, as well as our abilities to Bump or Ram other vehicles to get them out of our way! Learning the specifics of each section of the Hollywood Death Race board was a little tricky for us, though. There were a few cases where the instructions could have been clearer or maybe outlined in a different order or a different way, and we found ourselves needing to flip through the rules often, especially as we maneuvered from one board segment to the next, because each segment does have its own rules and special spaces. Perhaps a player aid could help with this, or icons added to the boards themselves just to remind you of which rules are in effect where. Once the bumps of learning the game were past, though, we really enjoyed the race. Each board segment will have certain spots where you can try to pick things up - like the valuable Effexium cubes used to power your special effects, or crates of props, which allow you to draw Props cards that can give you immediate bonuses or longer-term benefits. On many spaces, you'll have to roll dice to see if you're able to pick something up, and if you're successful, you'll increase that board's Countdown Die by one - making it harder for the next player to be successful. Other boards have enemies, like the Zombies at the Black Friday Mall! The placement of the various helpful spaces - often in more out-of-the-way spots - led us to a lot of strategic thinking. Do you just push on as fast as you can, not bothering to pick things up? Or is it better to spend a board or two trying to gather props and Effexium to make you unstoppable in later stages? We all tried different strategies at different times and really enjoyed the variability of the game. We wound up each having favorite boards and favorite characters, too, and that's something that gives a game real staying power in a group - the more attached I become to the story we build ("Look out, Catman! Laura Craft is on your tail - just get to Jurassic Land as fast as you can - there's more Effexium there! 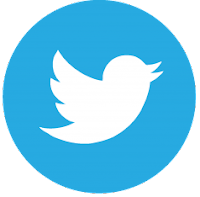 "), the more likely I am to bring it out again and again. The biggest draw for us was the bounty of pop culture icons and jokes in Hollywood Death Race. 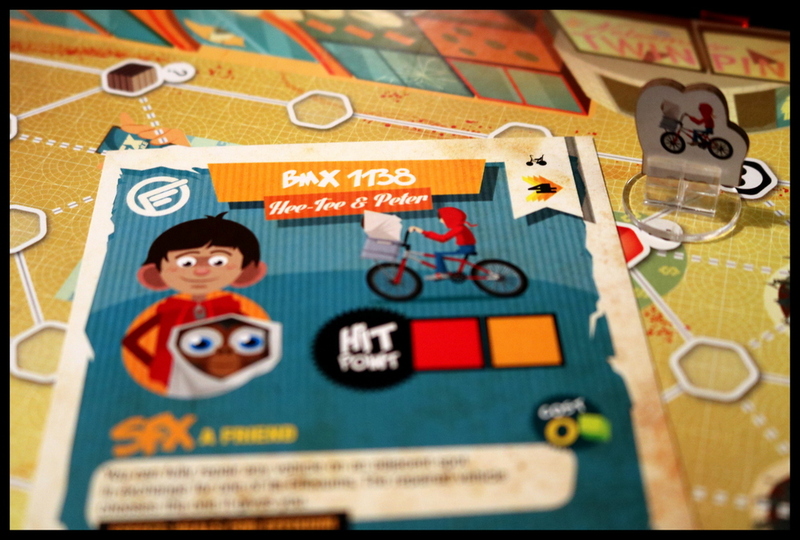 We loved being able to relate to the characters in the game immediately, and we pored over the art on the cards and boards in geeky admiration. 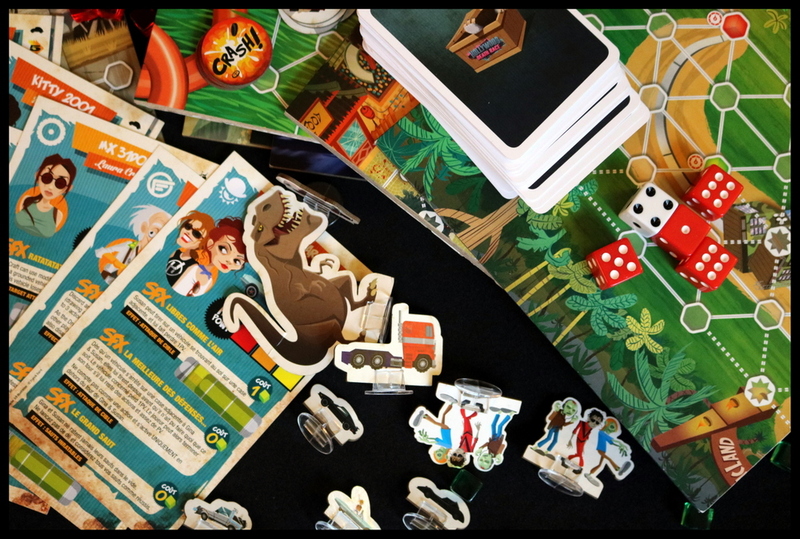 We especially enjoyed Hollywood Death Race with six players, playing three teams of two - there's a lot of fun to be had in the camaraderie of racing as a team, and it's something that we don't have in any of the other games in our collection. 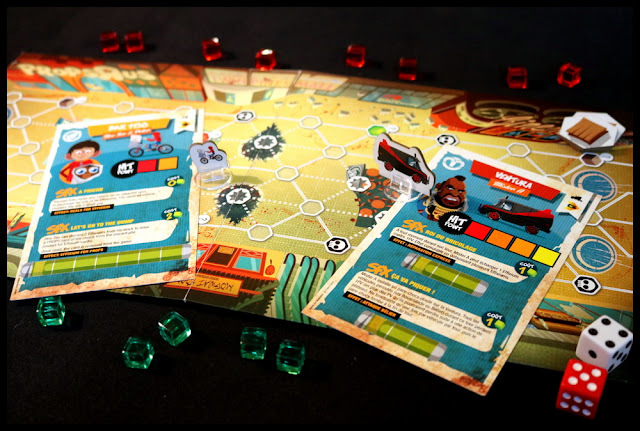 The Props cards, special effects, and unique board abilities make Hollywood Death Race more than just a straightforward racing game, adding strategy, fun, and interest to the basic go-as-fast-as-you-can mechanic. 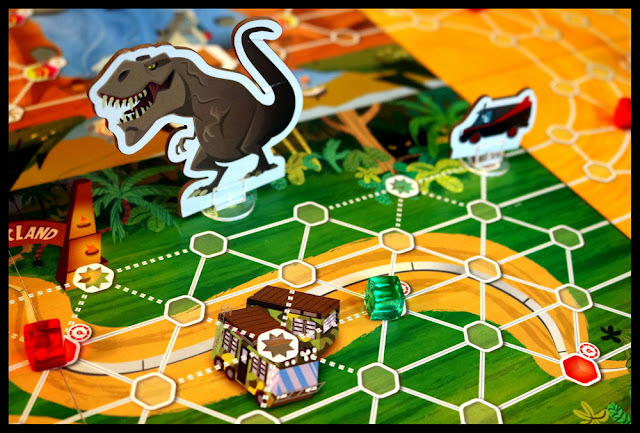 Our players struggled to learn the different boards - the icons, the special effects, "When does the T-Rex attack, again?" and we found it difficult to quickly find those answers in the rulebook. 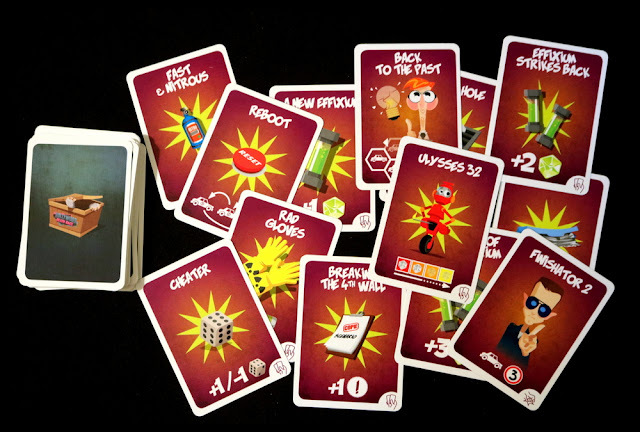 Perhaps a player aid-type card for each board would be the best fix for players who are learning the game, and/or a light retooling of the rulebook. Hollywood Death Race seems ripe for expansion - as we were playing, people would chime in with the names of other famous drivers/vehicles who they would like to see, and other movies whose sets would make a great board. That's not a bad thing, exactly, except that those expansions haven't happened yet! Hollywood Death Race is clearly aimed at players who love pop culture, especially 80's and 90's movies and its wide-ranging characters. Players who enjoy racing games like RoboRally or Formula De may find something new to enjoy in Hollywood Death Race. 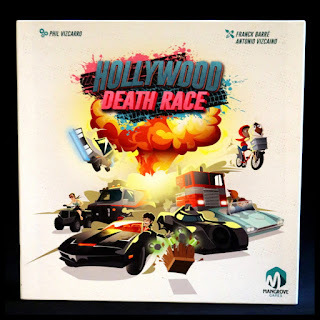 Hollywood Death Race is a campy romp through your favorite half-forgotten movie sets, with plenty of teamwork on one hand and take-that attacks on the other to keep all players involved and racing towards the finish! It earns a spot on our shelf, especially great to pull out at the beginning or end of a movie night. 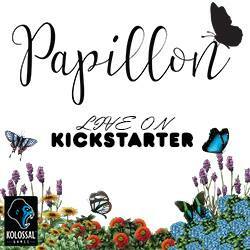 I wish the creators luck on their upcoming Kickstarter! On KICKSTARTER now! 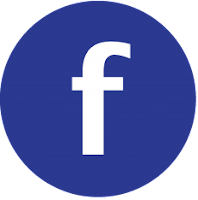 Campaign ends October 26, 2018. 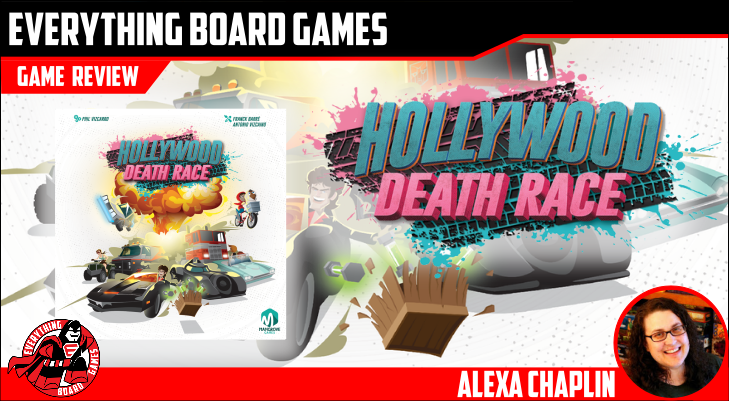 I am the game designer for Hollywood death Race and I can confirm that you will have icons and aids on the boards in the final version, in order to stay in the game and not have to get back to the booklet.